Indiana Senator Greg Walker announced that he will propose The Indiana Freedom in Homemade Food Contracting Act, also known as The Indiana Food Freedom Act, in the upcoming session of the Indiana State Legislature. 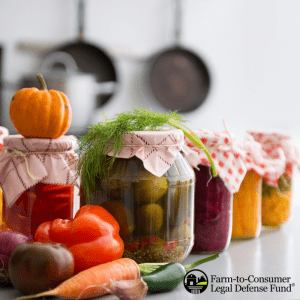 The Indiana Food Freedom Act seeks to allow small-scale producers to make foods for sale in their home (or farm) kitchens, creating greater access for consumers to healthy, local foods. Additionally, advocates of the bill anticipate it will offer a boost to the agricultural economy and encourage sales for ranchers, farms, and home-based producers. This bill will take a somewhat different approach from other food freedom bills in that it will require a formal, contractual agreement between the producers and consumers permitting the sale of foods prepared in unlicensed and uninspected private kitchens and farms. The contract will have to be signed and notarized, and there will be a one-week waiting period between the signing and any food exchanging hands. This requirement is presumably intended to address some of the common objections to food freedom bills by creating a barrier to so-called more casual transactions where consumers have not had time for significant thought before purchasing. The Indiana Food Freedom Act is the latest legislative effort to strengthen Indiana’s local food system. In 2014 Indiana passed Senate Bill 179 (SB 179), known as The Poultry Bill, which expands on-farm poultry processing in the state; the bill also eliminated regulation from county health departments over poultry, rabbit, and egg sales direct to the consumer. Additionally, Indiana has legalized the on-farm slaughter and processing of rabbits and amended a regulation on wild pigs ensuring that heritage breed hog farmers are no longer a potential target of the law. Food freedom and cottage food laws are designed to free small-batch producers from the often arduous licensing requirements required of larger commercial operations, as long as they are selling direct to consumers. These laws recognize that direct producer-to-consumer transactions have a transparency and accountability that is not present when food is produced and distributed on a massive scale. Consider that all of the major recalls and large-scale outbreaks have occurred in the conventional system, under inspection by the Food and Drug Administration (FDA), United States Department of Agriculture (USDA), or their state agency equivalents. Re-connecting food producers and consumers and decentralizing our food system restores integrity and increases food safety in the long run. If you live in Indiana, you can help this bill become a reality! Find out who your State Representative and Senator are at www.iga.in.gov. Then call their offices and urge them to support the food freedom bill in the upcoming legislative session. And stay in contact with their office throughout the session because building a relationship with your legislators is vital to successful, long-term change. If you’re in another state and know of a good bill (whether it is to promote cottage foods, food freedom, raw milk, egg sales, or other), let us know! We’ll help spread the word and generate grassroots support for it. For members, FTCLDF also offers consultations on policy development and strategy. DOCUMENTARY: You will not believe what your supermarket vegetables are grown in!